In the interests of compliance with the EU Cooking regulations that come into force in May 2012, I am investigating what cookies this blog uses in order to function. In the interim- I personally do not collect any personal information from you on this site, and to the best of my knowledge the only 'widget' that I have installed that collects anything that isn't strictly necessary to the running of the site is the map at the bottom which records what country visitors are from. As soon as I have completed the appropriate cookie audits over the next few days, I will update this and act accordingly to complete compliance with the regulations. 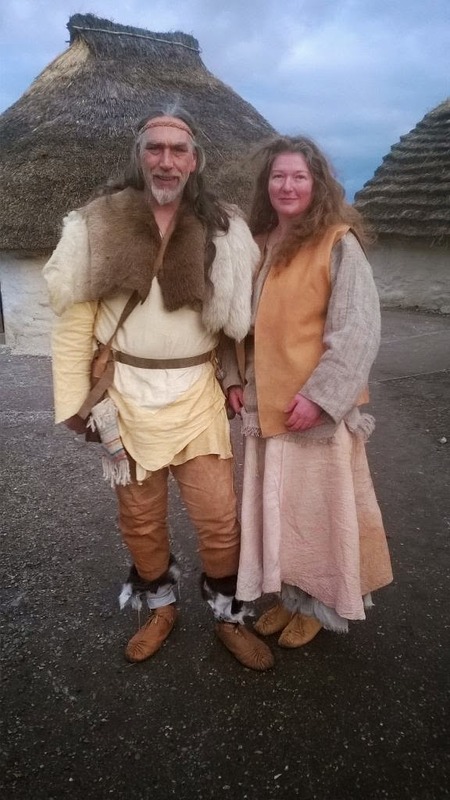 In the last few years we've been doing more and more education work bringing aspects of Neolithic life to schools, museums and heritage sites. Even though people are becoming more settled by the Neolithic, its probably not the only house structure available to them. 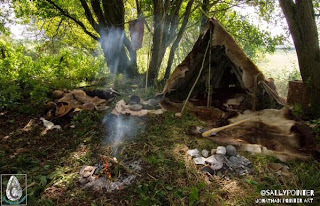 We know that from the earliest evidence onwards people have constructed simple shelters using locally available materials, intended to be used for a few weeks or a season whilst hunting, foraging or even, perhaps, visiting other communities or ritual sites. The normalisation of farming doesn't happen overnight and its likely that for a very long time groups of people still go off on prolonged hunting or foraging expeditions, or perhaps build seasonal settlements whilst herds are kept on pastures away from the main village. To this day, in Alpine regions known for transhumance, there are structures of stones that date back into prehistory believed to be associated with the base of temporary shelters. 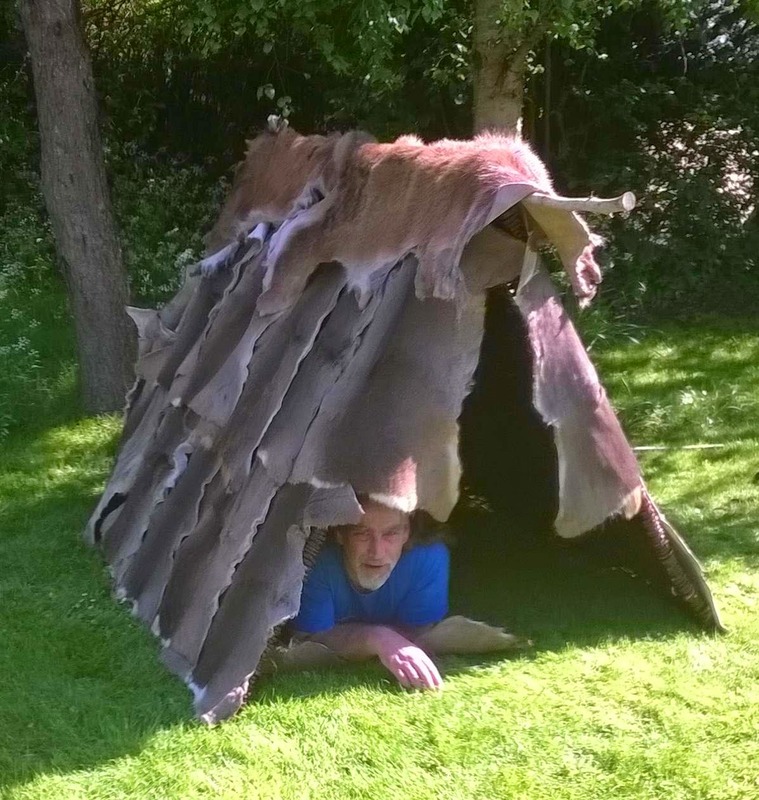 Last Autumn, we built a conjectural Neolithic campsite with James Dilley, including a rectangular structure based on a sloping A frame of sticks, covered with hides (allegedly from our 'hunting expedition'). This sort of thing is fine when you have plenty of time to cut sticks, lash them all together, arrange the covering and get comfy, but we often have to set up 'camp' just for a few hours when doing education work, and we wanted something that would allow us to discuss the difference between permanant and temporary dwellings, materials, construction and daily life, all without it taking longer to set up and take down than we have available. So, we set about building a flat-pack structure that we could put in the van easily, set up in a few minutes and properly risk assess so we know it wasn't likely to fall down in the middle of a school playground. Yes, there will have to be some compromises, but as far as possible we want groups using it to be able to suspend disbelief and imagine themselves sleeping and basing themselves around a camp for a while. 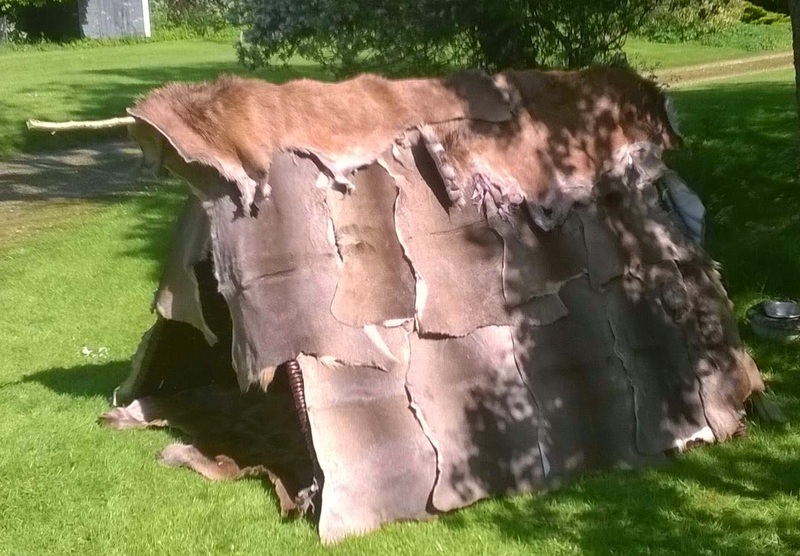 We can't help it, very soon we started calling it the Neolithic Wendy House, and its stuck. 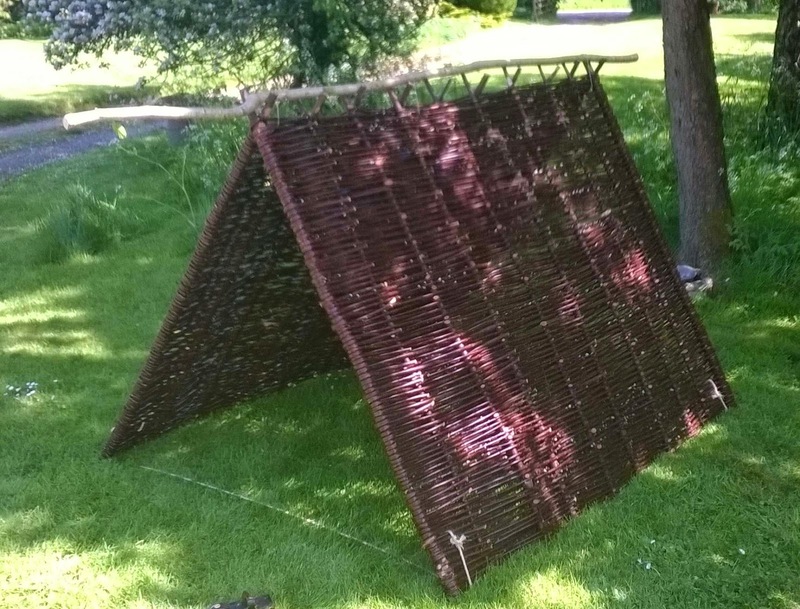 Two large hazel or willow hurdles: The originals I'm sure would have been woven together as needed to stabilise sticks laid against a central ridge pole, but hurdles create a stable base that won't collapse. Our hurdles were a bit too big, so we cut them down giving some additional fencing which might be handy when setting up a display. Extra sticks, to form a stable ridge and extend the back of the shelter. Set the hurdles up to form an A-frame shape. Early structures appear to have often used rocks to help stabilise the sides, but we're using ropes to stop the base settling out into an unstable wider shape. 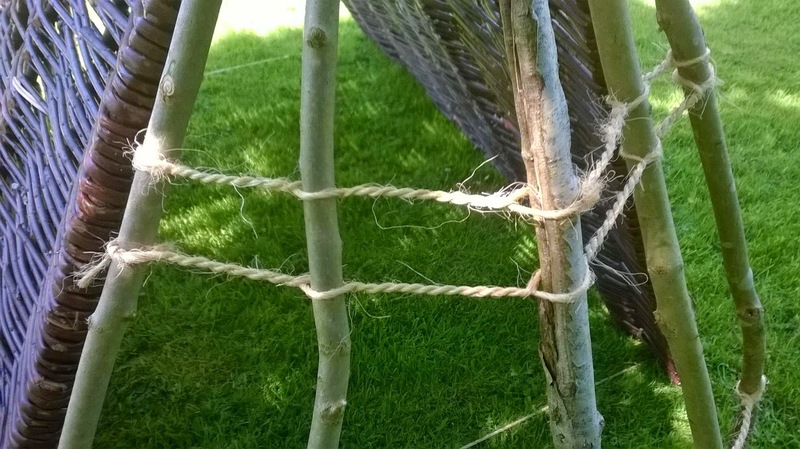 Lash a sturdy pole across the top of the interlocked hurdles to stop the top opening out. This also results in a handy pole at the front to hang things on. Use extra poles to extend the back. We want this part to fold down later so we've twined the poles together using cordage. Withies or thonging would be just as good. Pierce the hides and use thong to 'tile' the roof with them. They'll provide insulation and help rain run off. 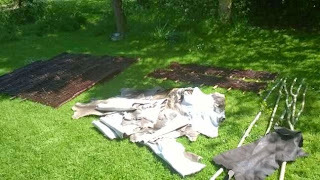 Put down hides for flooring. To take it all down later, we just need to unlash the top ridge pole, remove the back extension, fold it all up and wrap it ready to go into the van. Yes, its heavy, but its not unmanageable. Putting it up next time should be fast too. 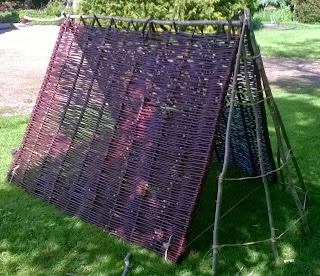 We might also add some netting with stone weights to help hold down the roof, it is thought that some pierced stones found on early sites may be from similar netting and it would be a nice way to include another technique. Is it absolutely accurate? No, of course it isn't, but we think it creates a structurally stable and plausible setting in which children can role-play and discuss life in the past with us during sessions. We're always happy to hear constructive suggestions that will make it even better for this purpose. We'll be giving this its first public outing at Bryn Celli Ddu this coming summer solstice. We are based Wales and travel around the UK, if you know of an event or school that might like to book us for a session on Neolithic life and crafts, do get in touch!